If a tree falls in a forest but there’s no one there to hear it, does it make a sound? That’s one of the more well-known riddles of modern times. Almost everyone has said it, heard it or pondered it at some point in their lives. Most probably dismiss it outright taking a stance that seems simplest – my guess is they insist it DOES make a sound, probably in emphatic terms – “Of COURSE it makes a sound! Why wouldn’t it? A tree doesn’t need an audience, you idiot!” – and then they want nothing more to do with it or with you again, feeling they’re wasting their time on stupid “What ifs” that make no real difference either way. The fact that they can’t prove it though is probably what really irks them. The mere question itself is a tribute to man’s egotism. This notion that something can’t truly exist unless its existence is acknowledged by human beings. Rock ‘n’ roll music is the ultimate exercise in this theoretical quandary. For more than a half century the majority of those writing about it refused to even contemplate that rock existed until they (collectively, if not individually) became aware of it, the supreme example of something not existing in their minds until they themselves perceived it to exist. Hence the “Birth Of Rock” usually being pegged somewhere around 1954-1956 when white America was introduced to it. We know of course this is flat-out wrong. But what’s “right”? That is, what is definitively provable – is another matter altogether. What we DO know and probably can all agree on regardless of our position as to the specific date each person settles on, is that like so many other cultural evolutions (revolutions???) rock emerged from a bewildering series of interconnected events occurring in a somewhat haphazard, but rapid, fashion. But it did NOT occur in the 1950’s. Not even the early 50’s, as those who have settled on Jackie Brenston’s “Rocket 88” as the “first” rock record would claim. Rock ‘n’ roll – the distinct musical and cultural phenomenon – began no later than the fall of 1947 with the release of Roy Brown’s Good Rocking Tonight. That’s the moment where everything came together – the music, the specific audience’s reaction to it that propelled it to importance and the unique cultural perspective they shared and expressed through that music – all combining to create inexorable sweeping changes that are still being explored, now seventy years later. But it might’ve poked its head out even earlier than that. All of which brings us back to the same Sphinx-like riddle, but this time with a twist – If Amos Milburn makes a rock record before that but nobody really notices, does it qualify as the first rock record? If you say yes, I won’t argue, even if I disagree on a technicality. Amos Milburn, along with Joe Turner, Wynonie Harris and a few others, WERE rocking before Roy Brown released Good Rocking Tonight. But they were rocking, the descriptive adjective, not quite making rock, the definition as a proper noun. Semantics? Sure. But important ones I think. Amos Milburn’s musical instincts were certainly as a rocker from the start. One listen to “Down The Road Apiece” cut back in 1946 confirms this. That other rock legends from Chuck Berry to The Rolling Stones revived the same song in the same fashion years later seems to give weight to the idea that Milburn, not Brown, was “first” (not that any “historians” bother going back this far, god forbid!). But even granting Milburn with a bit more credit for coming up with key components rock would soon embrace we run into a few more issues to muddy the waters, starting with the fact that “Down The Road Apiece” wasn’t even Amos Milburn’s song to begin with. It had originally been a hit by the Will Bradley Trio from 1940 featuring Freddie Slack on piano. It was a good song even then, but it was presented as a novelty with its extended spoken-interludes, jokes and even a whistling section, but it certainly has a good structure for others to build upon, which is precisely what Milburn did when he came along a few years later and tackled it. In the process the 18 year old fit it to his own budding style and delivered a scalding take on it. But few noticed. There were no reactions to it from the musical community that immediately changed the landscape. Others didn’t race to cut songs in a similar nature themselves. There was no clamor for that type of song to follow from the public, nor from record companies, no shift in the demographics buying records and influencing the charts as a result. No introduction of new terminology to describe such sounds and it certainly didn’t reflect, nor spur, any larger cultural movement. What it shows though is that there was something in the air, like the smell of rain before the clouds appear, where you know a storm is coming, you can sense it, feel it almost, but you can’t be entirely sure of its arrival until you are wet. To use another euphemism it’s not the pregnancy but the birth itself that heralds the official arrival of the baby. That’s how history records it at least. So Amos Milburn gets shortchanged by that history just a little. This then is Milburn’s first official entry into the rock sweepstakes. Blues At Sundown certainly isn’t more rockin’ stylistically than “Down The Road Apiece”, or for that matter “My Baby’s Boogying”, both of which came out earlier than this. But the context has changed. You could argue that rock did exist back then and those records were what introduced it, but I don’t think when looking at the evidence that anyone could argue that rock DIDN’T exist once Good Rocking Tonight came out in September, 1947. Now one month later Milburn, who’d come to the party before the doors had opened only to knock and find no one answering, returned once he saw the lights on inside and strode into the fray, leaving no doubt as to where he was aligned. What stands out about Blues At Sundown isn’t its remote connection to the blues alluded to in the title, but rather its introduction of soulfulness into the vocal lexicon of rock. Roy Brown had done that as well, but with a gospel-esque style perfect for uptempo romps. Here Milburn serves up his brand of soulfulness with a far more laconic delivery that fits better with ballads and mournful laments. These approaches soon became twin pillars of rock which helped to give the genre its versatility to appeal to all sensibilities, from the dance floor workouts for when the party’s in full swing to the songs of seduction when you want to slip off with someone you met at that party for some he’ing and she’ing, even down to the type of despondent remorse exhibited here for when you never made it to the party in the first place, or maybe got in the door only to find the girl who caught your eye was going home with someone else. Maxwell Davis’s sensuous saxophone adds immeasurably to that mood here, responding to Milburn’s forlorn tale with empathy, seemingly helping to coax the words of distress from Amos’s vocal chords in an extended and masterful give and take exchange. Few partnerships in rock would prove as effective as the one between these two men. 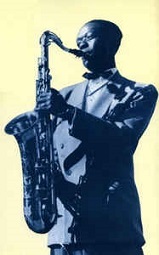 Maxwell Davis was such an integral figure in rock history, an A&R man who also produced and led the sessions on the floor, sometimes co-writing the material and always adding his prodigious skills on the horn to countless west coast sessions for more than a decade for a wide array of artists, but nobody Davis worked with over the years meshed better with him than Milburn did. Their byplay was so uncanny they almost demanded to be credited as a duo at times. Milburn’s skills are in full evidence here as well. Not just his tone and the way he draws out his vocals, adding depth to their meaning with his phrasing, but his piano playing acts in stark contrast to the downhearted lyrics, giving the song a jolt with an extended solo before it turns maudlin. It’s a strong performance all around, even beautifully mastered (another Davis credit, long before fidelity standards were particularly high, the records he cut always sounded clean and sharp), and it serves as a strong entry into the field that Milburn himself had presaged before it came into being officially. But… you knew there had to be a “but” somewhere… as solid as this is, as professional as it sounds, as well played and sung as it can be, it’s not quite seizing your attention. Maybe it’s that its charms are more subtle, its style less flamboyant, its performance more nuanced to really leap out of the speakers, but when comparing it to what we’ve heard thus far, the records which immediately let you know there was something happening here, that this rock ‘n’ roll stuff may in fact have legs, certainly something to get it noticed if nothing else, this record by contrast leaves only a fleeting memory. True, I praised Albennie Jones to the heavens for embodying many of these traits so well on The Rain Is Falling, even using the same descriptions to do so (subtle and nuanced), but somehow she left a much deeper impression that I can’t chalk up to mere taste, since Milburn not only was far more known to me prior to this, but someone whose body of work I find largely exceptional. No, it’s something else, I can’t quite put my finger on it but the absence of it, whatever “it” is, remains apparent. The record is better than average for sure and I really do like it, but don’t quite love it. If you feel otherwise I envy you. Records that require a little more depth of understanding to connect are always treading on dangerous ground. Too heavy-handed and it loses the emotional pull that it needs, yet if it eases off too much you don’t notice its more sublime charms. This one simply doesn’t apply quite enough pressure to transfix. Everything’s there for it to work, and it does for the most part, but it doesn’t fully pull you in. Its grip is just loose enough for you to slip away if you try. It fits perfectly well into the larger picture of rock for sure, but does not define that picture. The brightest, boldest colors within the frame are what rock needs to get you to stop and notice the different tints and shadings that songs like this add to the overall look. At this stage what gets noticed is decidedly more gaudy and colorful than the somewhat vague allure of Blues At Sundown. This one’s good, quite good in fact, but it isn’t starting any revolutions either. Milburn gets shortchanged again I suppose. 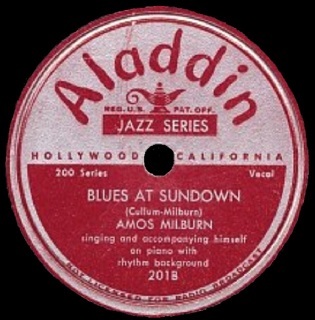 Leave a reply on "Amos Milburn: “Blues At Sundown”"